The below article is a guest post by Caleb Kruse, author of one of the most popular books about arguing! 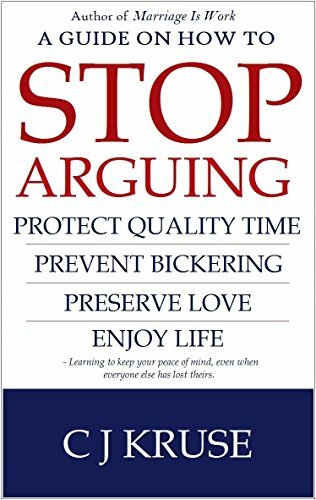 If you like the article below, be sure to check out Caleb's new book "Stop Arguing" on Amazon by clicking HERE. Arguing Tip #1. Focus on the positive. One thing about life is that it gets us to focus on a lot of the negative. If we aren’t noticing the threats, we are more likely to fall prey to them unsuspectingly. So, we form keen eyes for spotting them, and for noticing all of the negative. But, somewhere along the way, it seems we lose our ability to notice life’s good. And unfortunately, this hurts us, because noticing the good is one of those things that could dramatically restore our lives and our relationships. Tony Robins says that “where focus goes, energy flows.” George Lucas once said that “our focus determines our realities.” If this is true, our realities can be greatly enhanced, simply by enhancing the quality of things that we focus on. No doubt, this can help us in those moments when we are ready to duke it out, and we can’t even see how a moment is worth saving. Arguing Tip #2. Write It Out. When we sense that an argument is impending, it can seem like we have passed the point of no return. Many of us throw up our hands in surrender, letting out words we’ve held back, and doing destructive things that we regret later. However, there is an answer, even when there doesn’t seem to be. We can write out what we’re feeling. A lot of times, simply taking a reflective pause is one of the best things we can do. If you’re in one of those scenarios and it starts to feel like you’re sliding down a slippery slope, simply give it a rest and grab yourself a pen. Write down your thoughts on a pad of paper. When we write down what we’re feeling, we accomplish a few goals at once. One, we put into words what we want to say. Two, we avoid the risks of giving offensive looks or body language. Three, we increase the chances of saying what we mean. Four, we give ourselves the chance to be more familiar with our own thoughts before sharing them. There are many more reasons why we should write down our feelings. These are just a few. When we find ourselves running into a dead-end of disagreement, we might be able to negotiate with one another to reach a compromise. Maybe your husband will never agree that your next car should be a minivan. It might not even be worth your time trying to persuade him. However, you might have some good bargaining chips up your sleeve. Maybe, if he agrees to let you have your minivan, you can agree to let him choose where you all go on you next summer vacation. No, you might not be too thrilled about spending two weeks with his parents in Minnesota, but maybe it’s worth it if it gets you something that you want. If you give your situation a little mental energy, you may be able to avoid arguing by negotiating with people instead. Arguing Tip #4. Change the subject. The use of distraction can be a helpful tool, especially when used in a proper, healthy way. When we sense that a conversation is becoming unproductive, we need more than a simple desire to switch subjects. We need alternative subjects to switch to. This is something we can (and should) do now, before we even risk running into potential disagreements. Before getting there, take some time to think of some topics that you can switch to, like traveling, eating out, or trying something new. Have some prearranged conversations ready, so that, when the conversation starts to head south, you have a better direction to head it in. Sometimes nothing works better at changing our minds and our moods than changing the topic of our discussion. Arguing Tip #5. Opt for silence. Silence, as they say, is golden. When things quiet down we can hear ourselves think. We find answers that we weren’t aware of in the hustle and bustle of our daily, noisy lives. Sometimes, simply stepping away from a heated conversation can be the best thing for all involved. If you’re in an argument, or if you sense one forming, you might want to state your desire for some silence. The person you’re arguing with may gladly oblige. Maybe you both feel the need to regroup your thoughts. Be careful however, not to use silence as a weapon. There is a difference between being silent and giving someone the “silent treatment.” One is productive. The other is provoking. If you do choose silence, be sure that it is agreed upon, or you’ll only start a fight by attempting to avoid one, which would defeat the whole purpose. Simply state your request in a calm, kind way, and you’ll be more likely to get it. Also, you may want to determine when the conversation will resume, so that you both know that the silence isn’t just a way of sweeping unpleasant matters under the rug. Arguing Tip #6. Opt for solitude. Sometimes we just need a little “alone time.” We can just be ourselves, without the pressures of feeling like we have to do anything or be any certain way for anyone. We also can get that silence that we talked about earlier, which can help us regroup our thoughts. It’s okay to step away from a conversation that is becoming unproductive. Especially if one or more people involved are starting to get mean or insulting. No one should have to stay in a room with someone who is being disrespectful. And again, this too should be handled with care, as our wishes for solitude can appear avoidant or dodgy. If we’re not careful in how we ask for it, we may actually cause more problems than we are trying to solve. But, if we can successfully convey to the person we’re talking to that we have good intentions, and that our desire for solitude isn’t just an attempt to escape, it is far more likely to be a solution than a problem. Arguing Tip #7. Flip a coin. In the event that you can’t agree, you may also decide to leave your disagreement in the hands of chance. You want a Volvo. She wants a Volkswagen. You’ve debated for hours about which is safer, more dependable, and better performing. Neither of you has made any ground with the other. What now? Well, you can pull that shiny nickel out of your pocket, and call heads or tails. That is, if both of you agree to abide by the outcome. This is a lot like agreeing to disagree, only it lets fate pick the outcome for you, rather than either one of you being the decider yourselves. Arguing Tip #8. Plan for normalcy. We know that quality time isn’t always easy to come by. In fact, the more we yearn for it, the more touchy and defensive we become towards anything that might interfere with it… including each other. We long for quality time most when we’re exhausted and worn out, especially when relational tension is the cause. Of course, this puts a sense of pressure on us to relax and have fun. We can’t afford errors when quality time is so scarce and precious. But, this actually increases our odds for arguing. Because, as we make plans that are grand enough to meet our expectations, we forget to factor in the normal aspects of life, like the occasional glasses of spilled milk or the unpredicted rain. And, because we aren’t expecting these things, they are all the more unwelcome when they come. Most unwelcome of all, are those high-tension talks that pop up with your spouse from out of nowhere, regarding finances, big decisions, or that wrong turn you made four miles back. Such unwanted stress hits us harder than ever when we aren’t prepared for it. The moral to the story is that we should learn to create more accurate expectations. Let’s remember to factor in the high probability that normal life will occur on even the best days. This way, when normal life does occur, it will not seem so out of place and threatening. For more on the subject of argument prevention, click HERE!. This Drink Has Amazing Benefits! Should Your Coffee Be Organic? Mercola Talks - Natural Herpes Cures? What Was Jack Lalanne's Religious Affiliation? Are McDonald's Hash Browns Vegan? How is Methylcobalamin (vitamin B12) Made? What's the difference between a bar and a restaurant? Did Paul call Christian Vegetarians "Weak in Faith?" Peter has another blog at www.petekruse.com which features his original music compositions.